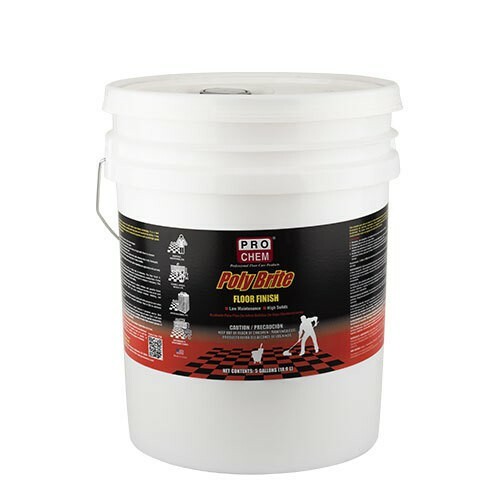 Poly Brite | Pro Chem, Inc.
POLY BRITE is a tough, durable, metal interlock floor finish that dries to a deep, even shine that enables it to be easily maintained. It is a hard styrenated acrylic formulation, providing both high gloss and excellent durability. It may be used with conventional low-speed or mop/recoat programs and provides excellent burnishing response with no powdering or dusting when using high speed burnishing equipment. Thoroughly strip floor with either Zip Strip or Super Wax Off. Rinse floor thoroughly with clear water. Apply 2-3 coats of POLY BRITE in uniform coats allowing the tile to dry thoroughly between coats. Allow for longer drying time in damp weather. Maintenance: Dust mop, sweep or damp mop as necessary. If desired, burnish with electrical, battery or propane high-speed buffers using a synthetic or synthetic/natural blend pad. Depending on traffic, burnish 1-3 times a week. Coverage will vary between 2,000 & 3,000 square feet per gallon. Not for use on ceramic tile or synthetic floors.